It’s been a dramatic season of Monster Energy Supercross as far as points are concerned, but the year was still lacking a truly wild race with tons of action. Only the chaos-fest in Arlington could really fit that description somewhat, until tonight, when things got real and real crazy all night long. 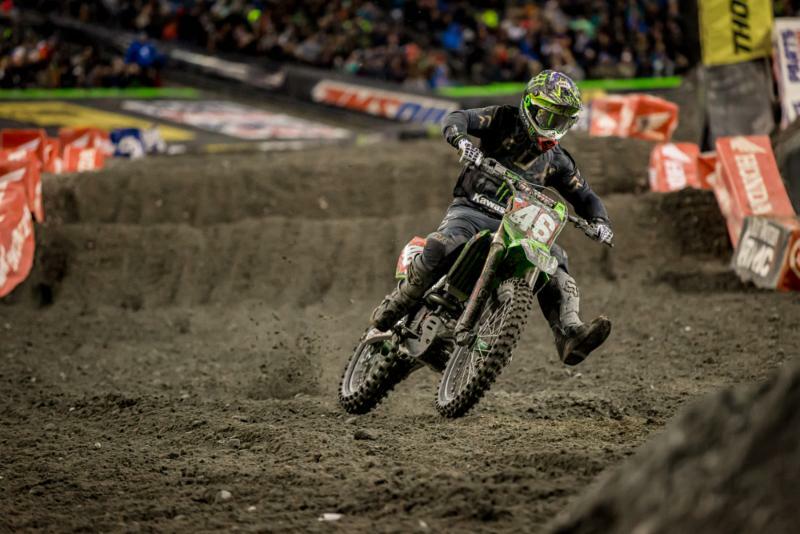 Seattle’s super soft dirt made for an unpredictable ride for everyone, including, most of all, the two series’ title combatants, Eli Tomac and Ryan Dungey, who had to log incredible rides to get their spots and salvage points after bad starts. But like that race in Texas two months ago, neither Red Bull KTM's Ryan Dungey nor Monster Energy Kawasaki's Eli Tomac got the win. Red Bull KTM's Marvin Musquin got the victory again, the Frenchman using his technical skill to conquer the rough and rutted track en route to his second career 450SX win. He snaked through the first corner well and then passed Jason Anderson for the lead. Second? Oh, that’s where it gets interesting. Cooper Webb was totally rejuvenated tonight on his Monster Energy Yamaha, he was fastest in qualifying and won his heat, and he started the main fourth. Cooper was back to the rider he was before he got injured back in Minneapolis. He was racy, too. At one point, Tomac caught him while coming through and made a quick pass. But the rookie showed zero intimidation and came right back with a block pass! That’s the kind of gumption expected out of Webb, and similar to his battle with Tomac in Oakland. Tomac actually backed it down for a second, saying he didn’t want to get into a situation he shouldn’t be in, before making another charge at Webb. Tomac had a crazy triple-onto-table jump combo, and he used it to get near Webb and try a pass on the inside. Tomac had to pull the front end high to clear the next jump, and it bit him when he clipped the landing and crashed. By then, the crowd was going insane, watching Dungey’s progress from the back while Tomac was getting up, losing several positions. Tomac, too, was thinking about Dungey and the points and the title. 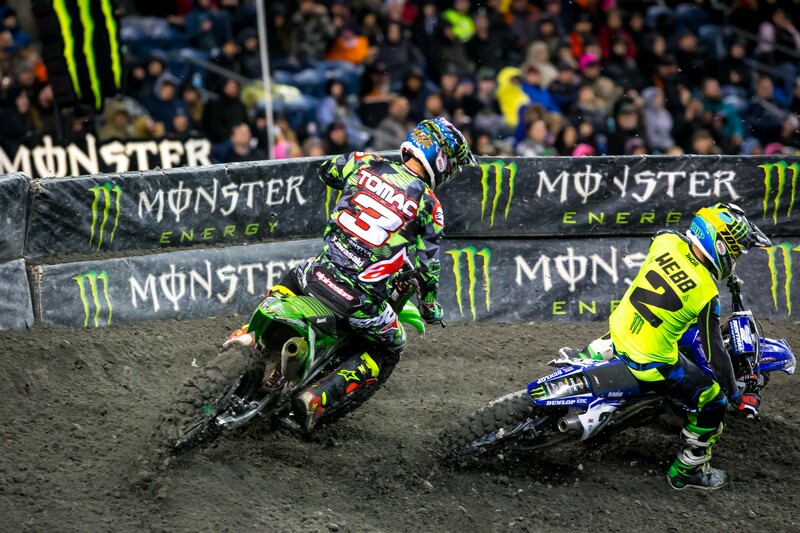 After the crash, Tomac settled back in and went back after Webb, who was battling Anderson for second. The last few laps were pure fury, Tomac trying to make passes, and Dungey a few spots further back trying to do the same. Anderson caught Webb and made a pass, then Webb crashed seconds later, then Tomac got Anderson right after that to steal second. The stadium was almost shaking over that, the fans saluting Tomac's amazing ride, with big passes and huge leaps. It was championship-level stuff, even if his second-place finish did end his five-race win streak. His best lap, by the way, was a second quicker than anyone else. "That was some chaos,” added Tomac. “I didn't get the greatest start, but I ended up finding some rhythm combinations early on that were huge in getting me to the front." For a brief moment, when Tomac took second away from Anderson, the Monster Energy Kawasaki rider was set to be the sole series’ points leader, but on the last lap Dungey passed Davi Millsaps to salvage fourth. That was enough to put them into a tie in the standings. What happened to Dungey? He got a bad start and then a tuff block got kicked out in the first turn and caught Justin Bogle, who crashed and tangled with Dungey. By the time he got up, Dungey was last and needed a few extra seconds to get his bike restarted. 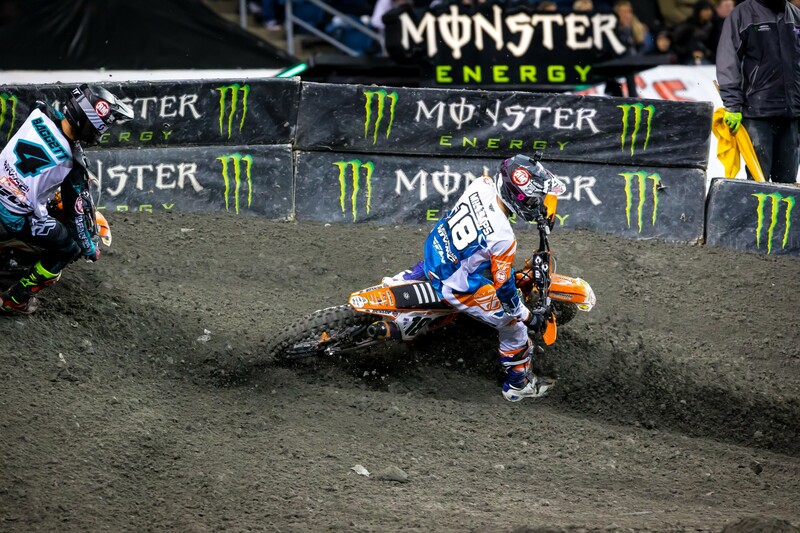 Like everyone in the race, Dungey had good and bad moments during the race. He didn’t pull the trigger on some of the bigger jump combos, which cost him some time, for example it took an extra lap to get Broc Tickle because Dungey chose not to jump a few triples in the rhythm lanes. It was actually on the final laps that Dungey looked best, uncorking more triples and getting Millsaps late for two huge points in the series. 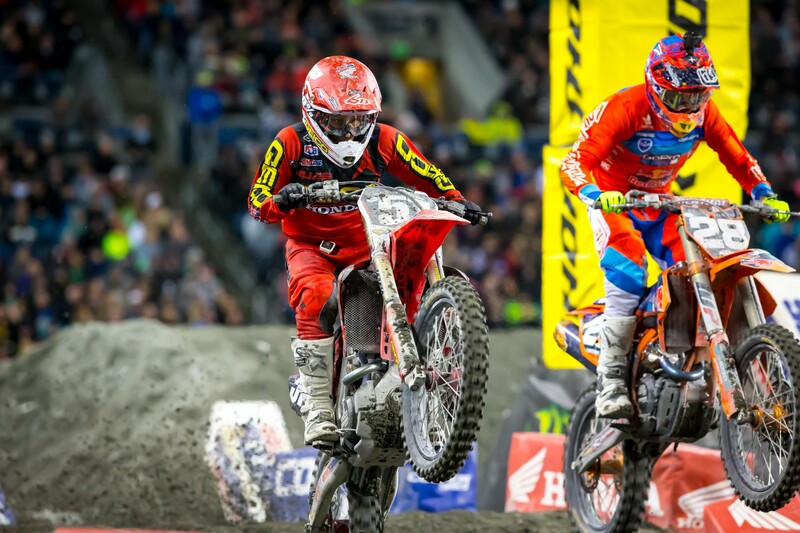 Overall, the race showed the contrasting styles between Tomac and Dungey. Tomac was all huge leaps and risks and big speed. 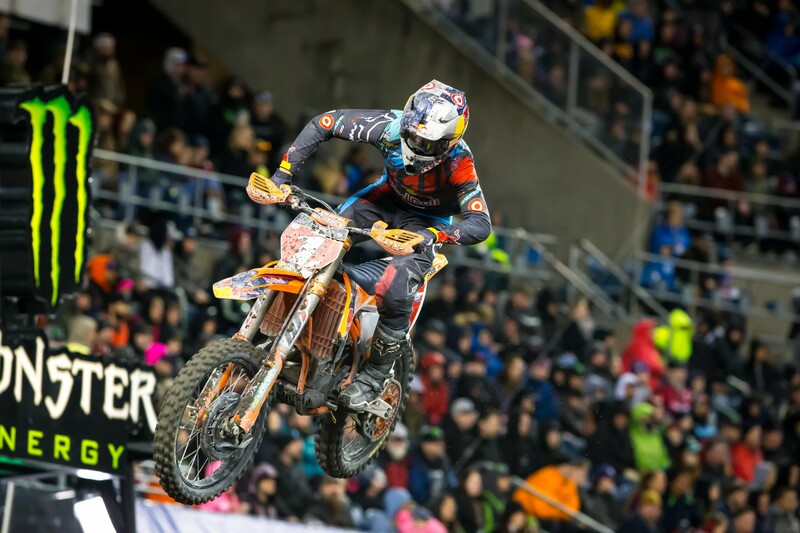 Dungey took far fewer chances, but also avoided any huge mistakes (whereas Tomac crashed). 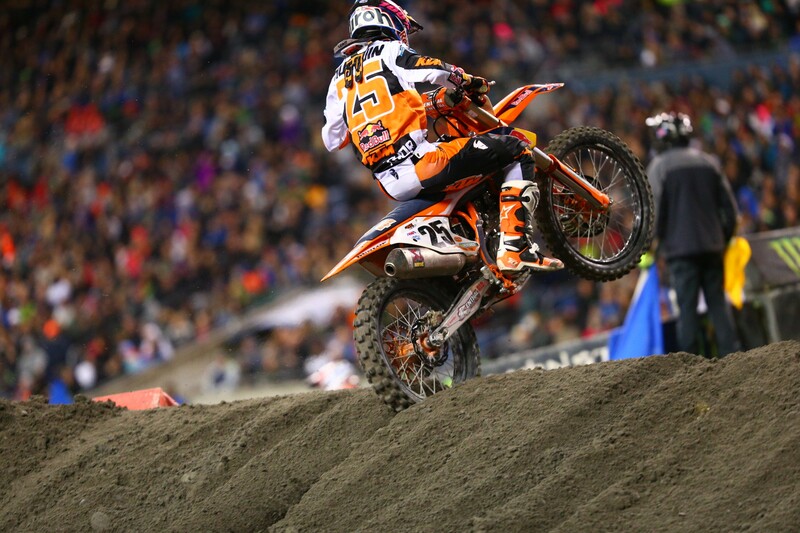 Millsaps was again solid, taking fifth, his second top five in the last three races on his Rocky Mountain-WPS KTM. He was also credited with the official holeshot. Millsaps is always good on gnarly, rutted tracks, and he didn’t have nearly as many near-crash moments as most of the other riders out there. Broc Tickle is also good on this stuff, and the Yoshimura RCH Suzuki rider was sixth. Blake Baggett was next, he had a brief crash in a rhythm lane. Webb recovered for eighth, and Webb’s teammate Chad Reed was ninth despite a brief detour to the mechanic’s area to get a rock out of his rear brake. 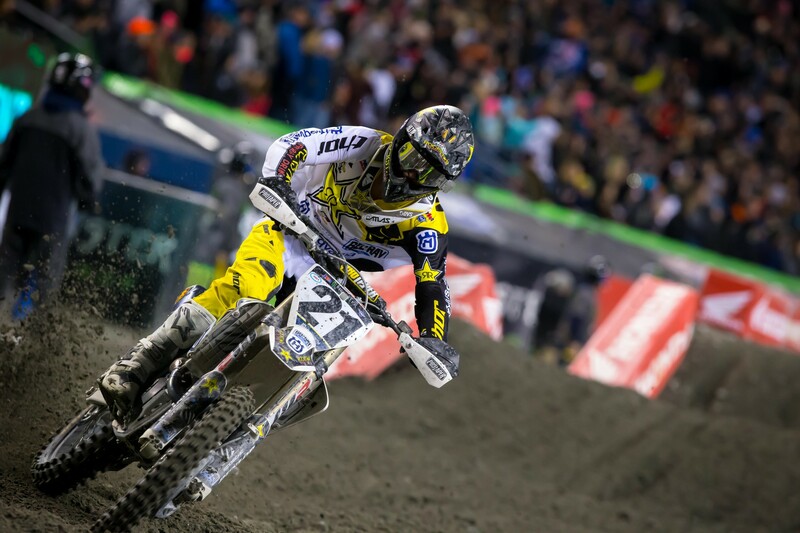 Dean Wilson rounded out the top ten on his Rockstar Husqvarna. The 250 race was only slightly more tame. 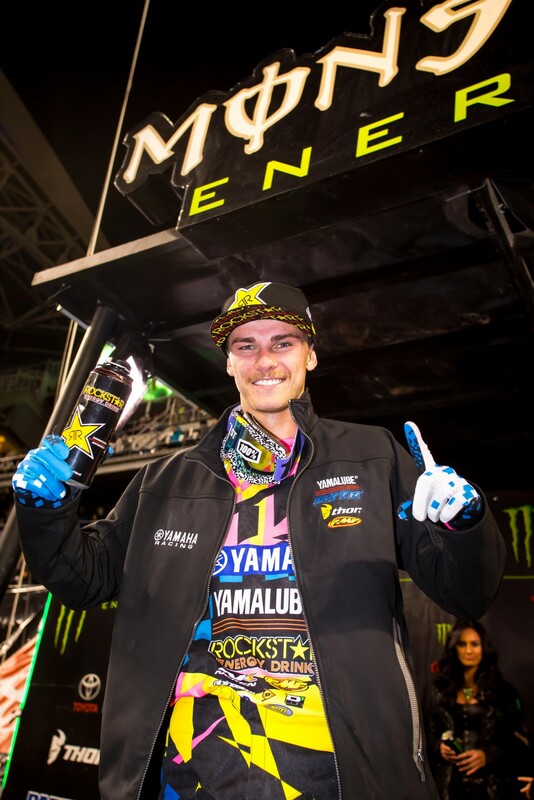 Yamalube/Star Racing Yamaha’s Aaron Plessinger was a predictable winner, because he’s bad-fast in gnarly ruts. The former off-road racer and son of a multi-time GNCC Champion led early, then the race was red flagged and restarted, and he got a decent start but had work to do. Work he did, passing Martin Davalos, Jimmy Decotis, Shane McElrath and series’ leader Justin Hill en route to getting the lead. Plessinger said these conditions are fun for him. "I got out front the first time and then they red flagged it. I thought to myself 'I can't catch a break,'" said Plessinger. "But I did it again and put my Yamalube/Star Racing Yamaha out front, and it was amazing. I haven't won a race this year and it feels great to finally get back on top of the box." Hill finished second on his Monster Energy/Pro Circuit Kawasaki and said the track was much harder than Plessinger made it look! Hill says he probably rode a little too conservative early on, as well. "I could have been better,” said Hill. “But we had seven weeks off and I have a little rust on me," said Hill. "All things considered, I can't really complain. I still have the points lead and I've been on the podium in every race but one. I think I can learn a lot from this and be better [at the next race]." The battle for third raged between two riders that were fighting for their first podiums. GEICO Honda’s Jimmy Decotis made a move on Rockstar Energy Husqvarna’s Martin Davalos to get into third, but Troy Lee Designs/Red Bull KTM’s Mitch Oldenburg was on the move, also trying to make his first trip to the box. Decotis fought like hell, but Oldenburg was a step quicker and made the pass to get the spot. Decotis got him back, but Oldenburg repassed him. On the last lap, Decotis said he was “tired of getting fourth” after finish there at his last two races, and sent it. He ended up crashing going over the finishline jump, and lost two spots picking his bike up. Davalos got buy, as did Shane McElrath. McElrath, by the way, is the man who coulda shoulda woulda been battling with Hill for the title, if not for a bike malfunction while leading the previous west race in Texas. McElrath needed a win here badly, but he crashed hard in practice and suffered a big bruise on his hip. He was hurting and managed to salvage fifth. Decotis (left) and Oldenburg (right) went at it for their first career podiums. Oldenburg got the spot and Decotis crashed on the last lap trying to get him back. 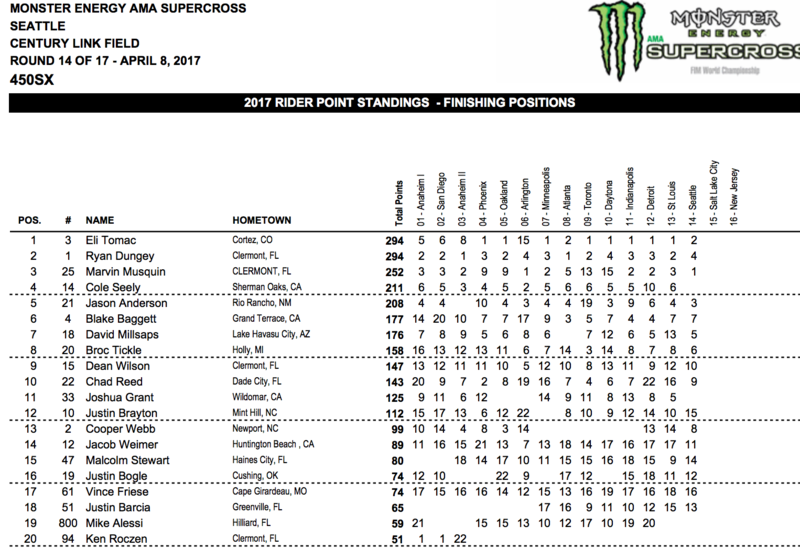 450 standings. Tomac and Dungey are tied! 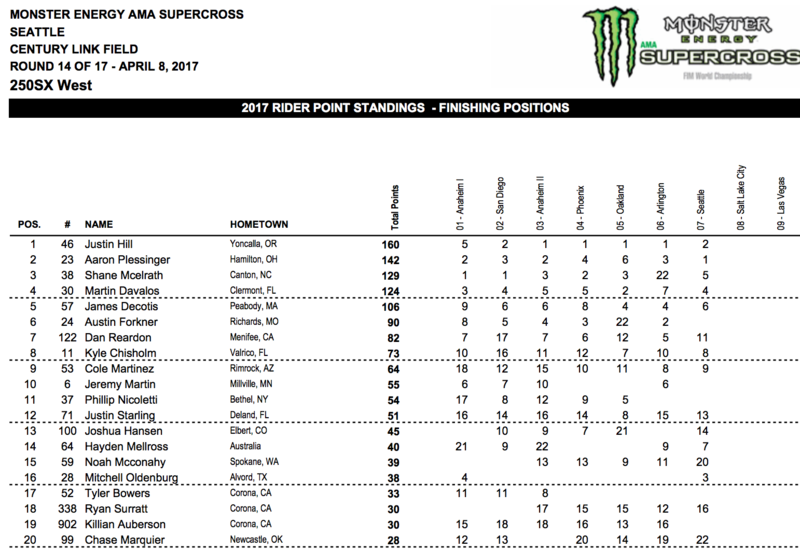 250 standings. 18 Point lead for Hill.